Twenty years ago, a horrific incident shattered the lives of five teenagers, including Allie Garvey. Drinking and partying in the woods, they played a dangerous prank that turned deadly. The teenagers kept what happened a secret, believing that getting caught would be the worst thing that could happen. But time has taught Allie otherwise. Not getting caught was far worse. Haunted for two decades by what she and the others did, the dark secret has eaten away at her, distancing her from everyone she loves, including her husband. Now, Allie is determined to learn how the prank went so horribly wrong. 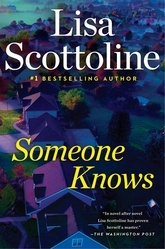 She digs to unearth the truth, but reaches a shocking conclusion that she never saw coming—and neither will the reader.